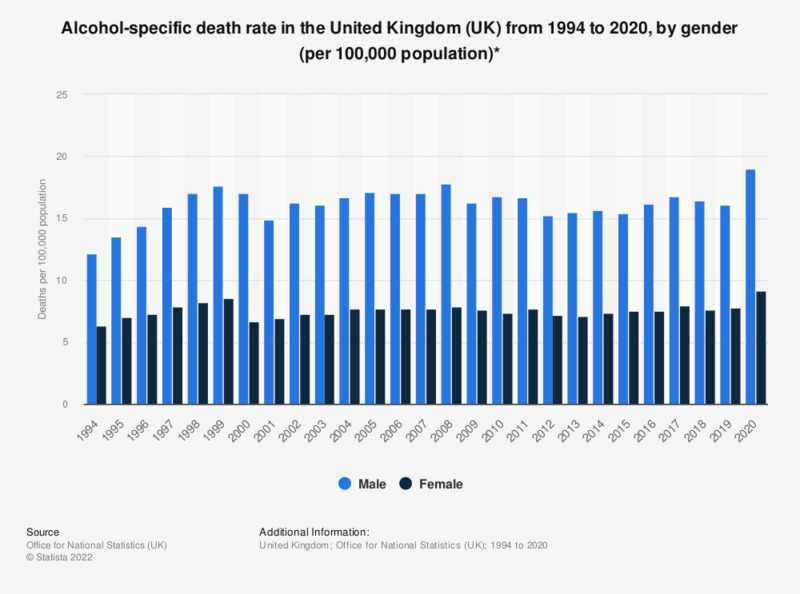 This statistic shows the alcohol-related death rate in the United Kingdom (UK) from 1994 to 2017, by gender. The male alcohol-related death rate peaked for this period in 2008 at 17.8, as the female alcohol-related death rate did with 8.6 in 1999. * The National Statistics definition of alcohol-related deaths only includes those causes regarded as being most directly due to alcohol consumption. It does not include other diseases where alcohol has been shown to have some causal relationship, such as cancers of the mouth, oesophagus and liver. The definition includes all deaths from chronic liver disease and cirrhosis (excluding biliary cirrhosis), even when alcohol is not specifically mentioned on the death certificate. Apart from deaths due to poisoning with alcohol (accidental, intentional or undetermined), this definition excludes any other external causes of death, such as road traffic and other accidents. The definition allows for consistent comparisons over time for those deaths most clearly associated with alcohol consumption. Rates per 100,000 population standardised to the 1976 European Standard Population. Data includes non-residents of the United Kingdom. Rates are not calculated where there are fewer than 10 deaths in the United Kingdom.